The New York Giants have signed unrestricted free agent outside linebacker Connor Barwin (Los Angeles Rams) to reportedly a 2-year, $5 million deal. The 31-year old, 6’4”, 255-pound Barwin was originally selected in the 2nd-round of the 2009 NFL Draft by the Houston Texans. He has spent time with the Texans (2009-2012), Philadelphia Eagles (2013-2016), and Rams (2017). Barwin has played in 127 regular-season games with 108 starts, accruing 55.5 career sacks. His best season was in 2014 when he compiled 64 tackles and 14.5 sacks. Barwin finished 2017 with 34 tackles and five sacks. 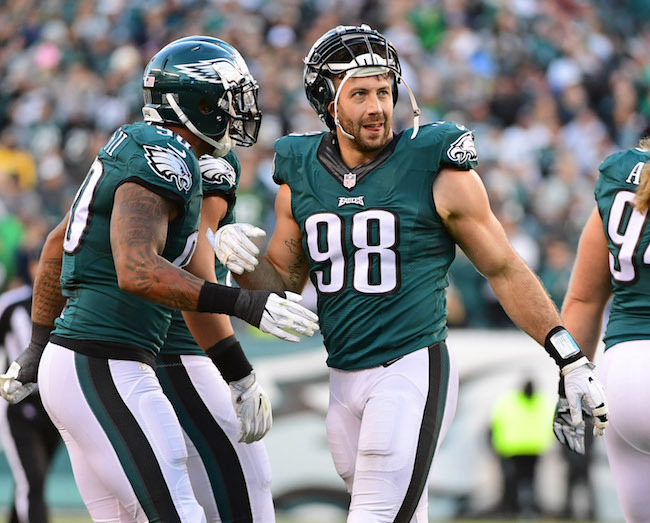 Barwin is a solid, well-rounded linebacker who is on the downside of his career. He is a good presence both on and off the field. The New York Giants have signed their 5th-round pick in the 2018 NFL Draft, defensive lineman R.J. McIntosh. All of the Giants currently on the roster are now under contract, including all of the 2018 NFL Draft picks. However, who missed all of the spring workouts with an undisclosed medical issue, will start camp on the Active/Non-Football Illness (NFI) list.